There are plenty of reasons why couples decide to create wedding hashtags for their big day. For one, it neatly organizes photos that guests take into one viewing space, so no one misses any fun pictures. The bride and groom can also easily visit their wedding hashtag and save photos straight from there. 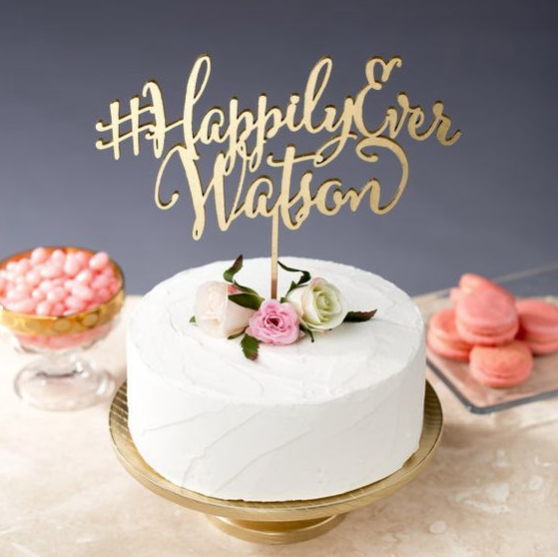 And, by having a wedding hashtag, many are finding that it gives their wedding day a unique “brand” and can even sometimes even factor into the wedding theme. This “branding” makes an already-special day even more special, and adds an element of new technology to a classic tradition. If a wedding couple is sure to include their wedding hashtag on the save the date, or simply have signs at the reception with the hashtag on it, guests really get into it and will most likely be encouraged to take more photos than they probably would have otherwise. Because of these reasons, wedding hashtags—which can be used on Facebook, Twitter, or Instagram—have become immensely popular over the last several years. Almost every couple now creates their own wedding hashtag to accompany photos of the entire wedding planning process up through the honeymoon. In fact, it has been reported that more than 55% of couples use one. Of course, with wedding hashtags now being the norm, the question that creeps up on many bride-and-grooms-to-be is: How do we come up with ours? The concerns that swirl around this question include being creative enough; being cute enough; being romantic enough; being catchy enough; representing personalities enough, and coming up with something that pleases both the bride and the groom. It may seem like an easy job to come up with a wedding hashtag, but you’d be surprised at how often it turns into a more frustrating, time-consuming task. So what’s a couple to do when they can’t come up with something that meets all of the wedding hashtag requirements of being cute, unique, and full of personality? Here are a few suggestions. Yes, there are people you can hire to come up with your wedding hashtags for you. For a fee, you can get a few original wedding hashtags and sometimes a “bundle deal” where they will also invent a hashtag for your bachelorette party or honeymoon as well. Couples submit their information to the “hashtag professional” (their names, nicknames, city of ceremony, etc. ), as well as the tone of the hashtag they want (cutesy, simple, funny) and await their hashtag creation. There are online wedding hashtag generators that allow couples to enter a little information (similar to the info in the section above) in order to decide on a hashtag for their wedding. It’s one step removed from hiring a professional, but some couples find it very useful—if not only to give them ideas. Some good wedding hashtag generators are WeddingHashtagWall, WeddingWire’s Hashtag Generator, and eWedding. If you’re struggling to get any good wedding hashtag ideas, get ahold of your most creative friends or family members and see what they can come up with. The advantage to this is that you can be very honest with your friends and family if you don’t like the hashtags they come up, whereas some couples may feel uncomfortable objecting to a hashtag that a hired professional has invented. When deciding on your wedding hashtag, make sure it’s unique enough that it won’t be confused with other hashtags. One of the main points of having a wedding hashtag is to have photos nicely organized together; you definitely don’t want to share a hashtag with another person, place, or thing and have to sift through other pictures—especially if it’s another wedding. That will get very confusing, very fast. However, don’t go too far in an abstract direction in an attempt to be unique. Your hashtag should still make sense and not cause your guests to wonder what it means. As much as you can, use words in your wedding hashtag that are easy to spell and that are used fairly often. As stated before, it’s important to set your hashtag apart from other hashtags—but also try to keep it as simple as you can. Stay away from inside jokes that most people won’t understand, or lengthy words that are hard to spell. Also make sure to capitalize the first letter of each word when posting it for others to see. With hashtags, the clearer, the better. 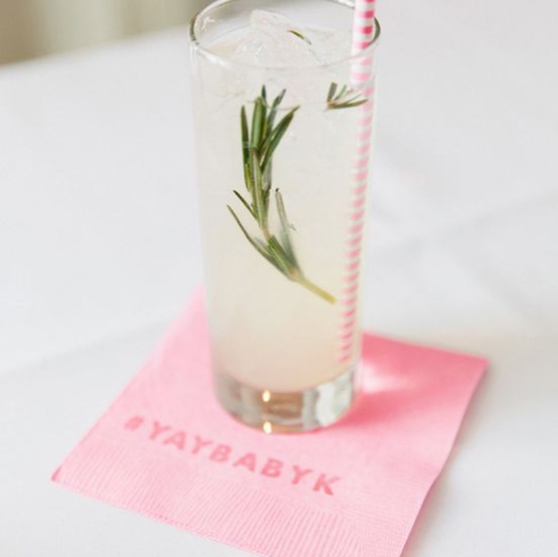 …Once you come up with your perfect wedding hashtag, you need to flash it around! 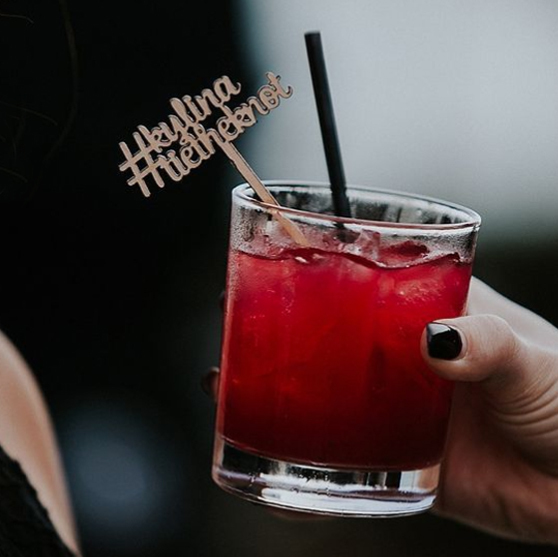 Besides the before-mentioned save the date, wedding hashtags are also great to incorporate into photo booths, wedding portraits, drink stirrers, cake toppers, cocktail napkins, letter balloons, and wedding favors (such as temporary tattoos—which make for great photo ops). For more great wedding planning tips on everything from wedding hashtags to catering to wedding dress deals, keep your eye on our blog! And if you’re currently planning your wedding and are looking for the perfect Los Angeles wedding venue, be sure to take a look at our photo gallery to see what we offer here at the beautiful De Luxe Banquet Hall!